Cystic fibrosis is a genetic disease that causes continuous lung infections and breathing problem over time. It is a progressive disease. The presence of imperfect gene causes a thick, sticky buildup of mucus in the lungs, intestine liver, pancreas, and other organs. The mucus in the lungs clogs airways and traps bacteria leading to infections that causes savior lung damage, and respiratory failure. The mucus prevents in the pancreas discharge the digestive enzymes that allow the body to break down food and absorb vital nutrients. This disease is caused by mutation in gene, cystic fibrosis trans membrane conductance regulator (CFTR) is a membrane protein in vertebrates, a protein required for regulating sweat, mucus and body secretions. 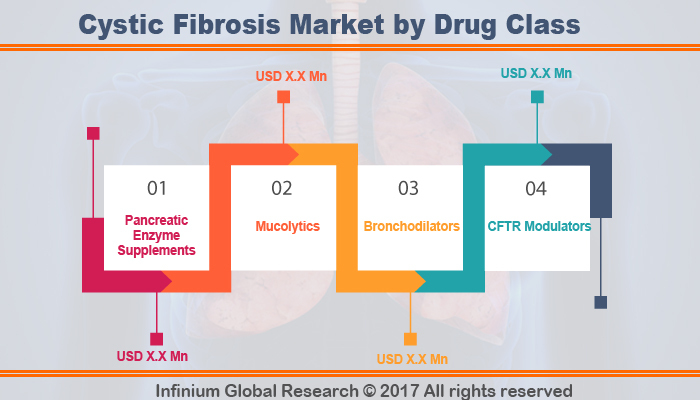 Improvements in screening and treatments are the major factors driving the growth of the cystic fibrosis therapeutics market. Due to Improvements in screening and treatments, mean people with cystic fibrosis now may live into their mid- to late 30s, on average, and some are living into their 40s and 50s. However, complicated pathophysiology, high cost of treatment and R&D and increase in genetic mutation rate are some of the factors expected to hinder the growth of this market. Furthermore, owing to continued extensive research and development activities, a variety of medicines are expected to launch in the market in future period. Increasing global awareness for cystic fibrosis therapy, technological advancements in the R&D is expected to further drive the cystic fibrosis therapeutics market. Among the Geographies, North America held the largest market share in 2017, owing to improve healthcare infrastructure and healthcare policies. U.S drives the North America market, owing to early screening of newborns for cystic fibrosis in every state in the United States so that this condition can be diagnosed within the first month of the life, before symptoms develop. The European market is considered as most lucrative market for CF Therapeutics, followed by the North American Market. The report provides regional analysis covering geographies such as North America, Europe, Asia-Pacific and Rest of the World. In this section the key trends and market size for each geography is provided over the period of 2015 – 2023. North America is accounted for largest revenue share as a majority of patients affected with CF are of Caucasian descent. The Asia Pacific market region is anticipated to grow at the highest CAGR over the forecast period due to underdiagnosis and lack of country-specific CF patient registries, rising awareness about CF disorders & treatment options is expected to boost this segment over the forecast period. The companies covered in the report include Vertex Pharmaceuticals Incorporated, Gilead, AbbVie Inc, Novartis AG., F. Hoffmann-La Roche Ltd, Alaxia, Merck & Co. Inc., AIT (Advanced Inhalation Therapies)., ALLERGAN., AstraZeneca, Teva Pharmaceutical Industries Ltd. and Alcresta Therapeutics, Inc. The report provides deep insights on demand forecasts, market trends and micro and macro indicators. In addition, this report provides insights on the factors that are driving and restraining the demand of cystic fibrosis globally as well as regionally. Moreover, IGR-Growth Matrix analysis given in the report brings an insight on the investment areas that existing or new market players can consider. The report provides insights into the market using analytical tools such as Porter’s five forces analysis and value chain analysis of cystic fibrosis. Moreover, the study highlights current market trends and provides forecast from 2017 to 2023. We also have highlighted future trends in the cystic fibrosis market that will impact the demand during the forecast period. Moreover, the competitive analysis given in each regional market brings an insight on the market share of the leading players. Additionally, the analysis highlights rise and fall in the market shares of the key players in the market. This report will help manufacturers, suppliers and distributors of the cystic fibrosis market to understand the present and future trends in this market and formulate their strategies accordingly.